The National Weather Service says some rainfall could limit snow totals, particularly south and east of the Lehigh Valley. The most snow is expected to pile up in the Poconos, although the Lehigh Valley could see as much as six inches. 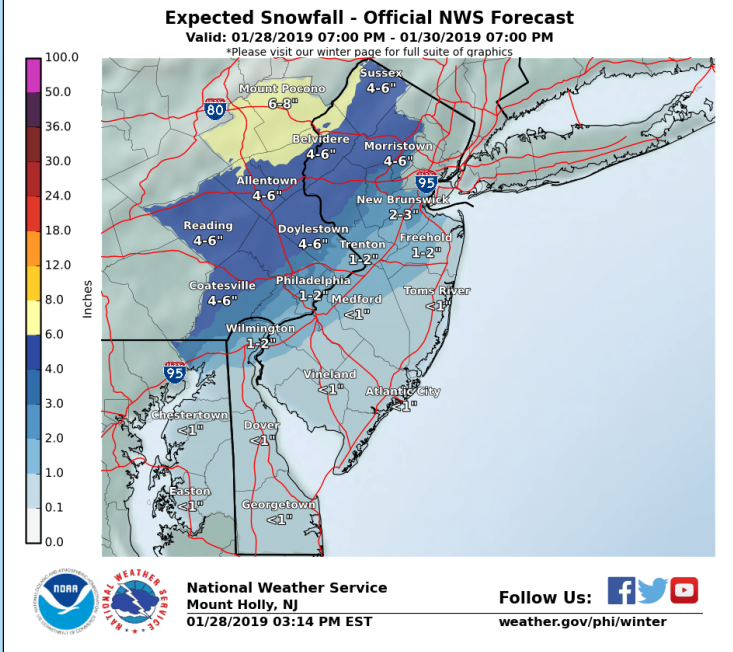 The National Weather Service has issued a winter weather advisory and increased its forecast snowfall totals for the Lehigh Valley for Tuesday, when hazardous conditions created by the precipitation could affect local commuters headed to work and school. According to the advisory, three to six inches of snow could accumulate from around 4 a.m. Tuesday until about midnight. “Snow is expected to overspread the region on Tuesday morning,” the National Weather Service said Monday afternoon. Moderate snowfall rates are possible during the day, although the snow could mix with some rain in the afternoon, particularly in areas closer to the I-95 corridor. Whatever snow falls Tuesday will be frozen solid by Wednesday if it’s not removed, because bitterly cold Arctic air is forecast to invade the area after the storm passes. Wednesday night’s low is forecast to be -2 degrees, and high temperatures Thursday may struggle to top 10 degrees, according to the latest forecast. As a piece of the polar vortex overspreads the region Wednesday, the NWS said it could be accompanied by scattered snow showers and squalls, which could reduce visibility on area roads and highways. Follow Saucon Source on Facebook for updates on this developing winter storm.